Harry Vardon, Jack Nicklaus Jr. The Jacobean-style manor house was built in 1890 for the Hanbury family and in 1923, it was converted into a girls’ boarding school. It remained a school until 1986, when it was ambitiously transformed into a luxury hotel and the prestigious Hanbury Manor Golf & Country Club. Harry Vardon originally laid out a nine-hole course in the majestic parkland grounds in the early 1900s, but it was Jack Nicklaus’s eldest son who brought the Hanbury Manor golf course back to life. Behind the manor house was an undulating piece of farmland and this was used for the addition of nine new holes and the original Vardon parkland layout was completely revised. The official opening took place in 1991, with an exhibition match between Tony Jacklin and Dave Stockton. Jack Nicklaus II was there too. Nicklaus II has done a great job. He has used many of his father’s tricks of the trade and created an exciting golf course with double fairways and plenty of threatening water. 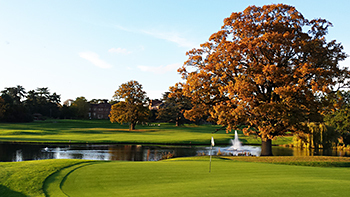 Hanbury Manor is PGA championship standard and it plays its length, measuring over 6,660 yards from the medal tees. The two nines are distinctly contrasting, each having a completely different look and feel. The newer front nine is much more exposed, laid out on undulating land in a modern American style while the back nine feels traditionally park-like with fairways flanked by stately trees. Hanbury Manor’s tournament potential was quickly recognised and, in 1996, Trish Johnson won the Women’s European Open by five clear shots. The following year, the Men’s PGA European Tour arrived in the shape of the English Open and the tournament remained at Hanbury Manor until 1999. Scoring well on this demanding course is easier said than done. The 8th hole is the toughest on the course, measuring 425 yards with out-of-bounds all the way along the right hand side. The approach shot to the green is tricky, even from the middle of the fairway. The green is elevated and protected by a lake on the left and a grassy hollow to the right, the ground and the green slope cruelly towards the lake. The back nine features some memorable holes, playing through majestic oaks and across numerous lakes. Hanbury Manor stands on its own in an area absent of great golf courses. There’s a lovely ambience to Hanbury Manor, an English rural version of an American Country Club. I was expecting a lot from this course given it's prior European Tour venue status and £90 green fee, however it failed to impress. The front nine is very open and plays completely different to the back nine with long walks between greens and tees. The condition was also disappointing with patchy fairways and what appeared to be diseased greens.A good corporate course at best, but worth half the green fee. I've played here a dozen or so times and nothing ever prepares you for the first tee where the green lies some 280 yards away over swathes of long grass and a bunker. Whether to assume your first drive of the day is going to be your best or bale out on the less than generous fairway to the right. This is far from your only directional decision on the course but confirms it as my best thinking man's course in England. The course is in two halves with the old easily outwitting the new. I also remember a less than well marked ditch where our buggy all but turned over in our efforts to avoid it. The restaurant is a tour de force. I have played at Hanbury annually since the course opened in the early 90’s and at present I would say the front nine is looking as good as ever. Not too easy to play the course unless you are a member’s guest, a resident or on a corporate, which does make the course look rather empty at times and I think this is a shame. Long gone are the days when Hanbury Manor should try to keep the place exclusive – times are hard and when the course hosted the English Open are a distant memory. If more golfers got the chance to play the course, then I am sure there would be more positive reviews and in turn a busier golf course. If you get an invite, always take it…. This course was in fantastic condition, particulary the greens that were as smooth as silk. However i'm not convinced that this should be ranked as high as it is, for it to be above Broadstone, Brocket Hall (Melbourne) and Blackmoor to name just 3 is a mystery to me. Don't let this put you off though as its well worth playing. The course plays very short of the yellow tees and offers may birdie oppotunities, try it off the whites for a challenge. There are plenty of risk and reward holes on this modern track, good thinking holes. For me the stand out holes are the four par 5's they are all guarded by water or huge bunkers. Set up for corp days, but play it if you get the chance. Your comments re Hanbury's position in the rankings has turned out to be very valid. Our new 2009 numbers sees the course drop behind the three that you have mentioned. Great thing about the course here is that it is a great test and not too busy. Course condition in 2008 has been better than my last visit (2005) and although there are bigger named courses with bigger reputations, Hanbury is a great stay and play option. The Sunday night option is great value. Par-4 8th is a toughie - the approach shot especially. Played the course in March and took advantage of their great value winter package deal.Found the course to be in excellent condition and the greens as good as you will find anywhere in the country.I have played the course a number of times now and always enjoy it and the surroundings. If you are looking for a corporate venue, look no further. I played here on a winter golf package in mid december. I could not believe how good the condition of the course was. I have played many of the great course in england usually in the winter as the cost is reduced but the condition of Hanbury Manor was way above all of those. They had just finished a bunker refurb the bunkers looked and played amazingly, if you go in any!. As for the cost of the round. It was £49 including bacon roll golf and a buffet lunch. In my opinion the best valued day out I have ever been on and will look to try to play in the summer. Play it if you can it is a real gem. Managed to play in a corporate in May 2006 and it has been about five years since I last played here. I can safely say that the course has improved and matured enormously in that time. Right now the course is in tip top condition, a real pleasure to play. The rough is up and the fairways are immaculately defined – My feeling is that the course is probably in as good a nick as it ever has been – the members that I spoke to think so too. If you can get a round here – look forward to it.